The world is smoldering toward catastrophic self-destruction, so it’s only sensible that I take a brief moment of clarity to offer this lovely tidbit of advice before the final tragic calamity ignites the end of civilization. If you want to appreciate form and function, escape chaos and crisis, and experience inner peace, you should hang a banana. I’ve survived more than half a century on this magnificent planet and only yesterday purchased a banana holder. 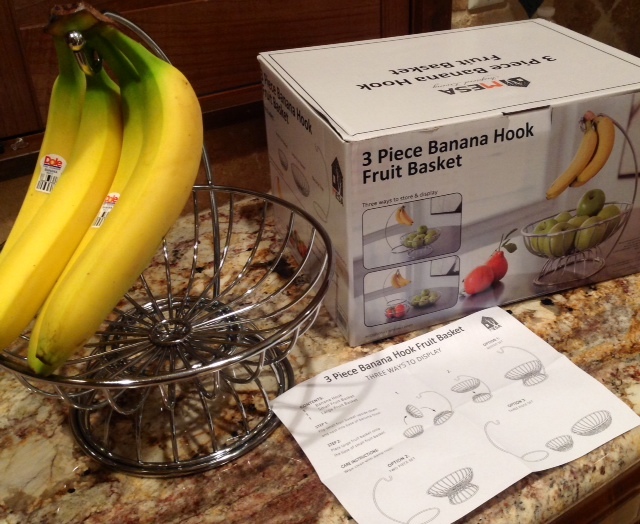 This is not just any ordinary device; it’s a 3-piece banana hook with fruit basket! And, it came with illustrated instructions! Heaven forbid a confused consumer would tote it home and not know how to assemble the complicated design. I balanced my new treasures with the massive supply of toilet paper, a calf-sized pack of paper towels, and a year’s supply of detergent while I maneuvered my way through the aisles, stopping periodically to sample the bland but free samples of food. I avoided the book section because I have been known to spend hours reading through selections while family-reunion-size boxes of frozen appetizers melt in the aisle. After paying the zombie checkout guy, I toured the vast parking lot looking for my car. I finally resorted to clicking my key alarm and eventually found it. I scurried home to assemble my new banana holder and proudly placed it on the kitchen counter. I carefully hung my bananas at the angle shown in the photograph. They seemed to be happy and perky in their appropriate position. Today, I’ll visit the local farmer’s market and buy some green apples. For a brief but delightful moment in time, I won’t watch or read the news, and I won’t worry about all the crap happening throughout the world. Instead, I’ll make a cup of tea in the morning and open a bottle of wine in the afternoon and stare at my banana holder. That’s about all I can control right now. And if other stressed people come to my door, I’ll welcome them inside and we will gaze at the wonderful invention and smile at the balance, order, and symmetry of the simple design. Then, only after we feel at peace, we’ll eat the bananas, apples and chocolate almonds, open another bottle of wine, and sing songs of courage and glory. All will be well, thanks to my new banana hook. With a fruit basket. It’s only 7:36 a.m. and thanks to this blog I’ve already had one of the highlights of my day. Sorry, can’t linger.I have to walk the dog, throw in a load of laundry, and drive to Costco.I want to be one of the crowd standing in front of Costco jostling for position while waiting for the doors to open.Then I’m heading straight for the spiffy banana holder with attached gleaming fruit basket. I’m reasonably sure my world needs one. Too funny! How have I managed without one of those? And, of course, now I can’t get Kim’s vision out of my head, either! Seriously, girlfriend. Addition??? But the post? Hilarious! I will admit it here, I have been thinking of buying one of these. Now knowing it comes with assembly instructions, I may just advance to the closest Costco! Thanks for the visual of sipping a cup of nice, hot tea and having a banana from the newly purchased banana tree. And powering down. That made me feel so good I might have to go to Costco to purchase a tree of my own! Thanks!!!! Costco has such a talent for making us buy things not on our list! I am usually happy with them though … although there is always some guilt associated with the chocolate covered almonds, etc that find their way home! How did I not know this exists? I’m with you on needing something light hearted today – I wrote about cupcakes! Have a great weekend – apparently I’ll be at Costco looking for a banana holder. Lol…. I love this post! It appears that I should be lamenting the experience I’m missing! I have a wooden one that my dad made. I love it!